Your garage door probably isn’t the first thing you consider when transforming your property, but it can make a huge difference to the appearance of your home. Whether you choose a solid wood design to complement your window frames, or a contemporary steel roller style, the choice of materials and styles is now extensive. When it comes to materials, you can choose whatever best suits the exterior of your home, from solid timber to laminated steel, aluminium, fibreglass and PVC. Modern garage doors, even timber ones, are generally treated to require little maintenance and higher quality electrical mechanisms tend to have components that are galvanised or zinc-plated to maximise their lifespan. If home security is your key objective, look at the strength of the individual panels – the most resilient are double-skinned, steel or insulated aluminium – as well as the quality of the locks. A common mistake is removing the existing locks and replacing them with a cheap electric opening system; it’s worth paying more for a remote-controlled system that is extra secure. Prices start at around £300 for a basic up-and-over garage door and frame, but can go up to £3,000 or more for supply and installation of a remote-controlled sectional door. If driveway space isn’t an issue, a traditional up-and-over door may be the best option and can be manual or electric. ‘Up-and-over doors combine quality, security, appearance and convenience with advanced technology,’ says David O’Mara, marketing manager at Hörmann. ‘With a wide choice of materials and designs, they can be incorporated into any home as an affordable, stylish solution,’ adds Simon Hipgrave, managing director of Garador. ‘A sectional garage door is made up of separate sections rather than a single panel,’ says Simon. ‘They rise vertically with no loss of driveway space in front of the garage, and provide full opening drive-through width, giving extra room for wider vehicles such as 4x4s and MPVs.’ ‘This construction principle means you can make full use of the space inside and in front of the garage,’ adds David. 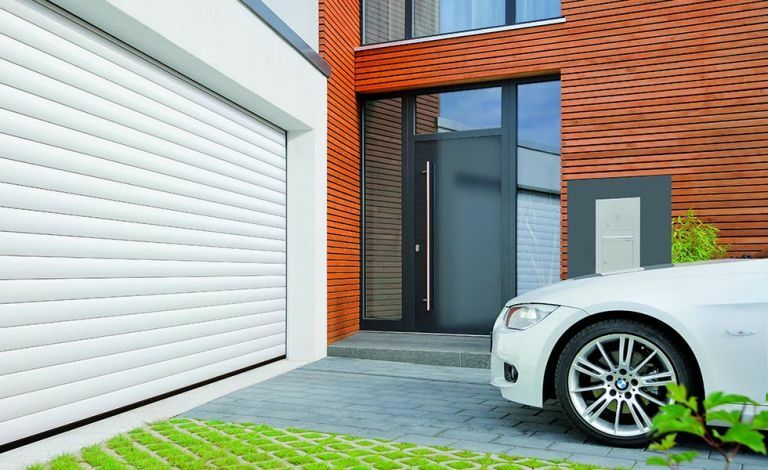 If you live in a spot exposed to harsh weather – on the coast, for instance – sectional doors can help keep your garage well-insulated and energy efficient.